Oh hey there healthy Eggplant Parm! Its so nice to finally meet you!! I LOVE eggplant parmesan but HATE the calories that so often come with it. I can’t resist the breading, spicy sauce, and gooey cheeses though…and then let’s throw it over pasta because let’s be honest, who doesn’t love carbs! I also love it in sandwich form, served on a toasted garlic roll, but that’s a whole other situation. Mmmmm! 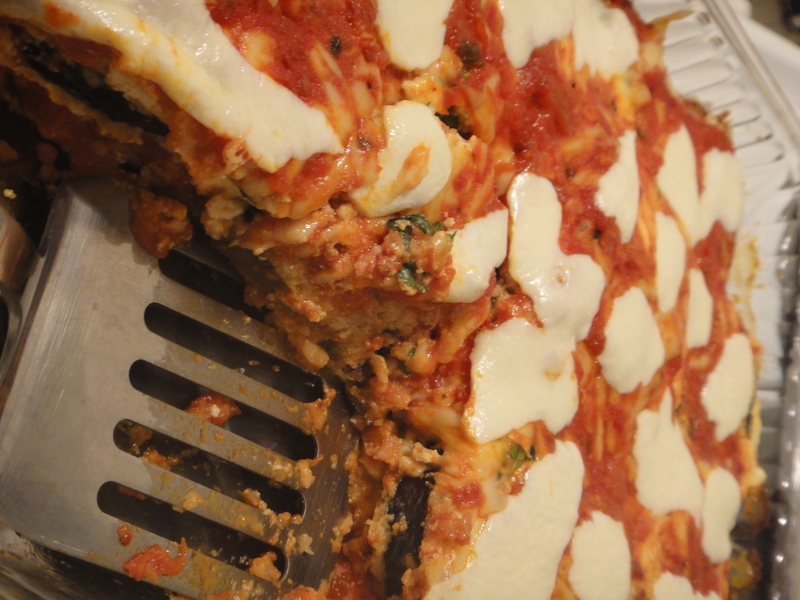 This eggplant parm is FAB-U-LOUS and has about half the calories as the normal version because the eggplant is baked, not fried. Honestly, once it was smothered in sauce and cheese, you really couldn’t tell the difference. A word for the wise…normally I would use my family’s secret recipe for sauce, but seeing as its a day long process and I’m down to my last 1/2 quart, I opted for a jarred sauce from the store. Make sure to pick a good one. I used this one since it had wine and a little heat in it. Perfecto! We hardly ever make this solo much food love your version! These looks wonderful! I <3 eggplant parm.